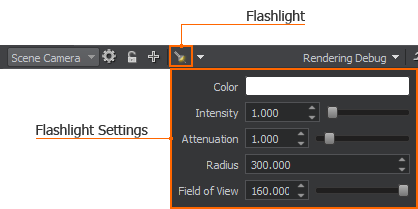 In UnigineEditor 2, there are controls that are used to move in the scene and control the camera behavior. All the available controls can be found in the Controls section of the Settings window. The camera can be moved freely in the scene or relative to a target. In terms of UnigineEditor 2, the target is a point relative to which the camera is positioned. You can set the target by focusing the camera on a selected node or a group of nodes. 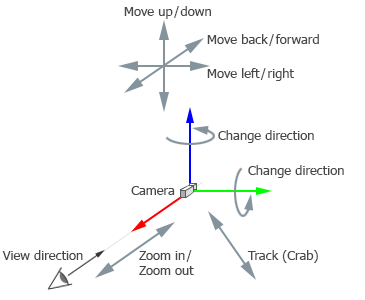 If the camera is not focused on a node, the position of the target coincides with the camera position. Whether the target is set or not, you can freely navigate in the scene: move the camera, change direction of the camera (horizontally and vertically), track the camera or zoom it in and out. If the camera is focused on a node (in other words - positioned relative to the target), you can also orbit the camera about the target and zoom it towards or away from the target by using the dolly zoom. Change direction means changing the yaw / pitch angle to rotate the camera around its vertical / horizontal axis respectively. Track (Crab) means tracking the camera in the plane which is perpendicular to the view direction. Orbit means tumbling around the target. Zoom (Dolly) means zooming the camera towards or away from the target so that the camera cannot continue to zoom in when it reaches the target. F Focus the camera on the selected nodes. G Reset the camera focus. You can also set the focus on a node by double-clicking on it in the World Hierarchy window. If the pivot point is set to Center ( is set), the target will be set to the center of selection. If the pivot point is set to Pivot ( is set), the target will be set to the last selected node. If you focus the camera on the node (or the group of nodes), the target position will coincide with the center of the node (or the group of nodes). 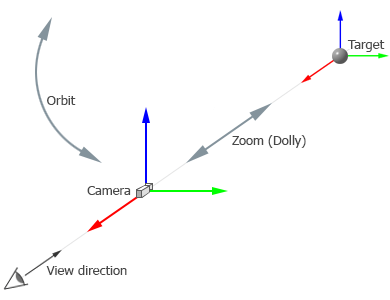 Therefore, you will be able to orbit the camera around this target and zoom (dolly) the camera towards or away from this target. RIGHT CLICK + Drag Change the camera direction. Press and hold this key and drag the mouse left or right to change the yaw angle. In this case, the camera will rotate around its vertical axis. Press and hold this key and drag the mouse up or down to change the pitch angle. In this case, the camera will rotate around its horizontal axis. RIGHT CLICK + W Move the camera forward. RIGHT CLICK + S Move the camera backward. RIGHT CLICK + A Move the camera left. RIGHT CLICK + D Move the camera right. RIGHT CLICK + Q Move the camera down. RIGHT CLICK + E Move the camera up. Alt + MIDDLE CLICK + Drag Track (crab) the camera in the plane which is perpendicular to the view direction. Alt + LEFT CLICK + Drag Orbit the camera about the target. WHEEL UP Zoom the camera in. If the camera reaches the target and continues zooming, the target will be moved with the camera. WHEEL DOWN Zoom the camera out. When zooming out, the position of the target remains the same. Alt + RIGHT CLICK + Drag Zoom (dolly) the camera toward or away from the target by using the dolly zoom. Shift Speed up the camera movement. Press and hold this key when moving the camera. 1 / 2 / 3 Enable the 1st, the 2nd or the 3rd mode of the camera speed. L Toggle a flashlight attached to the camera. A flashlight color intensity. The higher the value, the brighter the light is. A flashlight attenuation power. It simulates light intensity gradual fading. A radius of the area illuminated by the flashlight. A field of view of the flashlight. This parameter defines the angle of the light clipping in range from 10 to 160 degrees. In a large virtual world, you can use cameras as watchpoints for fast navigation: you can add and position any number of the cameras in different points of the world, save their positions and then switch between them via the Camera panel of the Scene Viewport when it is necessary. Add a new camera to the world. When you switch to one of the saved cameras, you can freely move it in the world: changes in its position and orientation won't be saved. Make sure that the camera is locked ( is set on the Camera panel) before moving it. Otherwise, all changes in its position and orientation will be recorded and you will have to position and save the camera again. To return to the saved position and orientation of the camera, switch to another camera and then choose the required camera again.